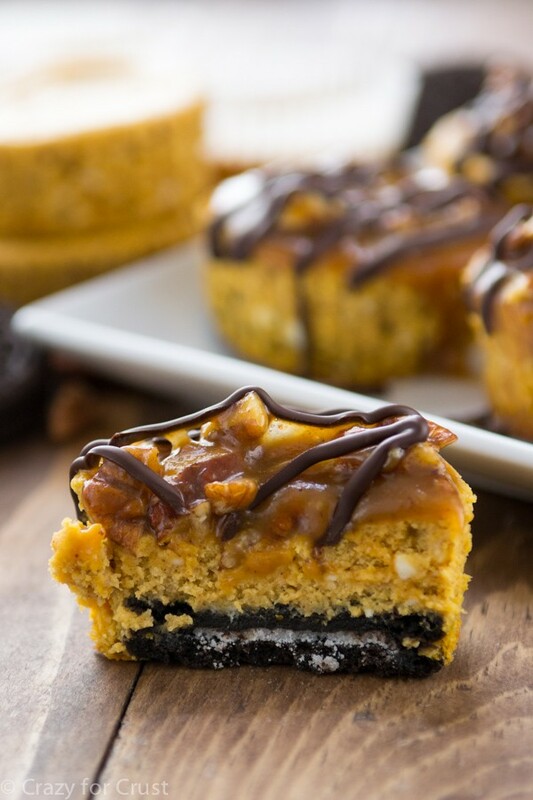 Turtle Pumpkin Cheesecake is better than just about anything. 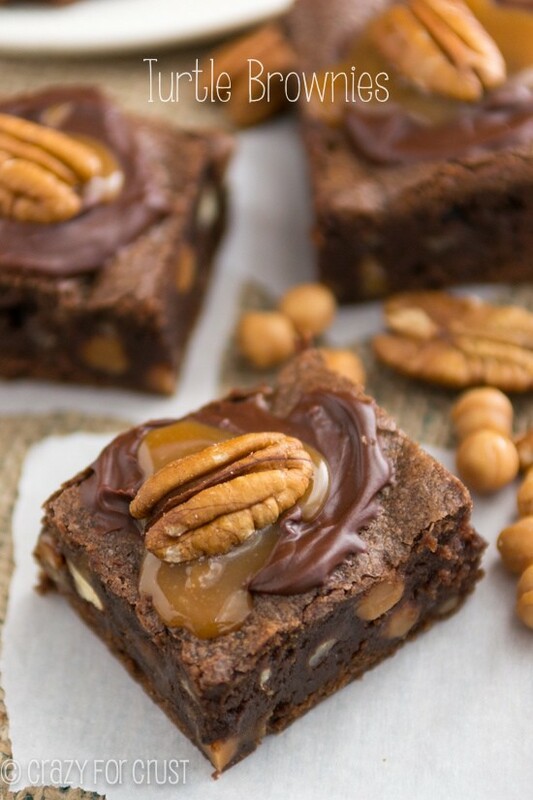 Pumpkin, caramel, pecans, and chocolate? Now that’s the best cheesecake in the whole world. Did you know that, when you die, you can be made into diamonds? I know, so cool right?? “Where did you get that diamond??! !” her friends ask. “Where did she get it?” they ask. “Er…it IS my mom…” she replies. That would be just so cool. Tormenting her from the grave. Every parent should do it. I wonder what color people diamonds are? Green like Mount Saint Helen’s jewelry? Sparkly, like vampires? Okay, so let’s talk cheesecake, because if there is one thing I like more than diamonds it’s probably cheesecake. Out of all the cheesecakes in the land, pumpkin is my favorite. I’ll never forget the first time I made it. I fell in love! For these Mini Turtle Pumpkin Cheesecakes, I decided to make them small. One, it’s more manageable to say “I ate a whole cheesecake” when it’s a mini one. Two, they’re portable, which is perfect for any holiday. Then I topped the cheesecakes with my homemade pumpkin caramel sauce that had been mixed with chopped pecans. If you don’t have homemade caramel on hand, feel free to use ice cream topping or any kind of caramel you like. On top of that? Chocolate. Of course. 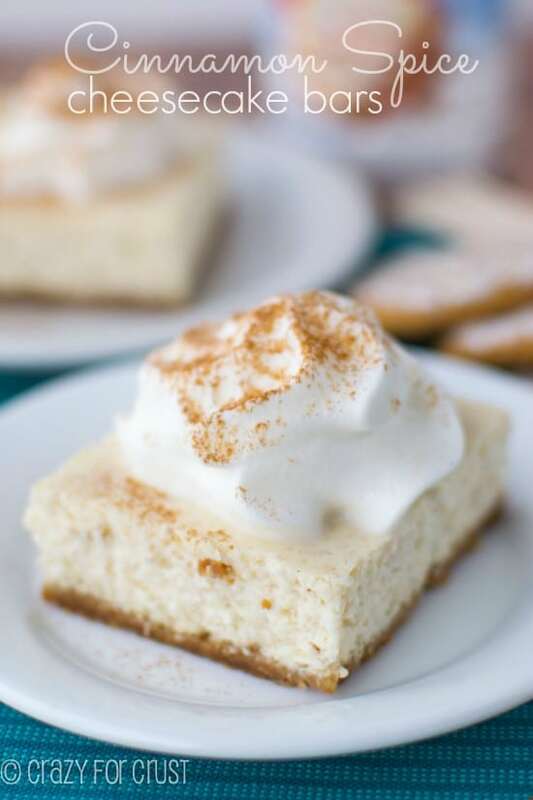 These Turtle Pumpkin Cheesecake are so easy to make and they’ll be the hit of Thanksgiving. Make sure your ingredients are all room temperature to avoid lumps. <– good advice for any cheesecake making! 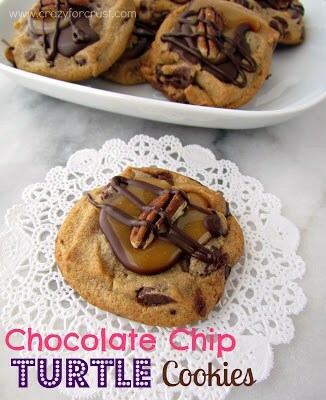 These are the perfect single-serve treat! 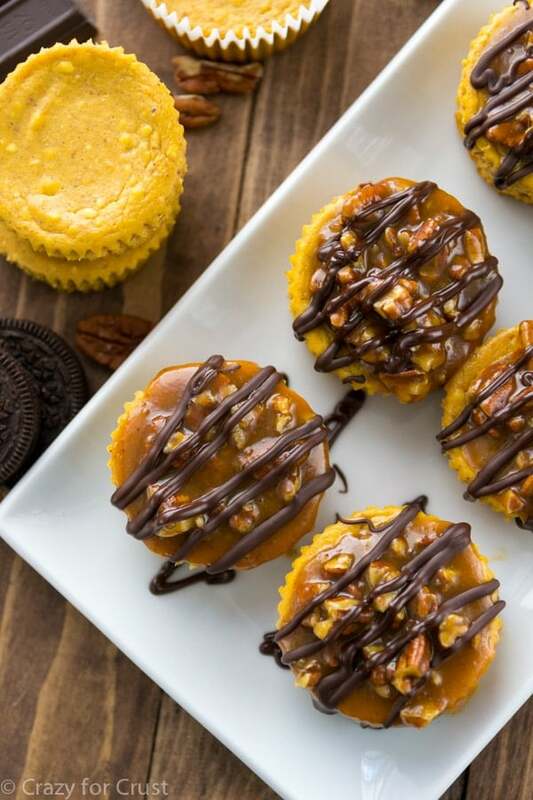 Mini pumpkin cheesecakes with an Oreo crust, caramel pecan topping and chocolate drizzle! Preheat oven to 350°F. Line a 12-cup muffin pan with liners. Place one Oreo in each liner. Make sure your ingredients are all room temperature to avoid lumps! Beat cream cheese with a hand or a stand mixer fitted with the paddle attachment until smooth. Beat in the egg, sugar, and pumpkin puree, mix until smooth. Add vanilla extract, pumpkin pie spice, salt, and flour, mix until smooth. 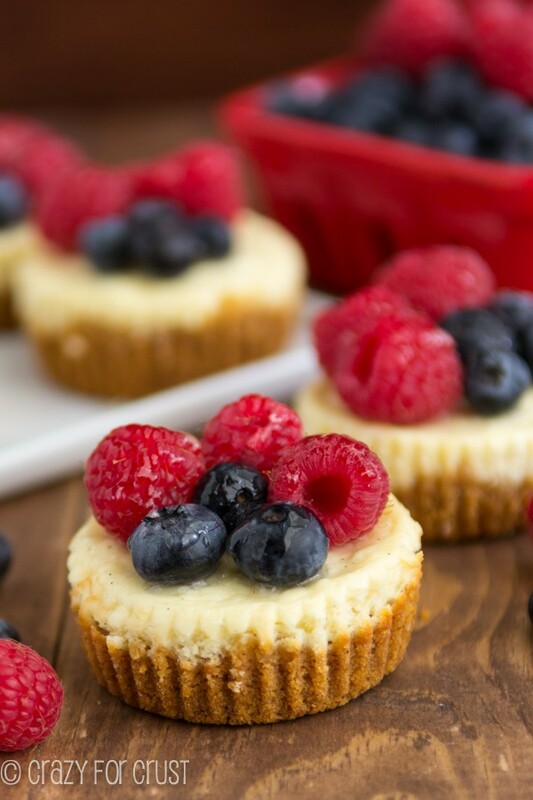 Bake for 22-25 minutes until the cheesecakes loose their glossy top. Some may start to crack around the edges, and a toothpick will come out clean from the center of the cheesecake. Cool completely to room temperature then chill for at least 4 hours or overnight. When serving: unwrap each cheesecake. Stir pecans and caramel together in a small bowl. Melt chocolate according to package directions in a small bowl and then place the melted chocolate in a ziploc baggie with the tip cut off. Spoon some of the pecan caramel mixture over the top of the cheesecakes, then drizzle with chocolate. Store in refrigerator. Will keep for up to 3 days in an airtight container or you can freeze the cheesecakes without the topping for up to one month. 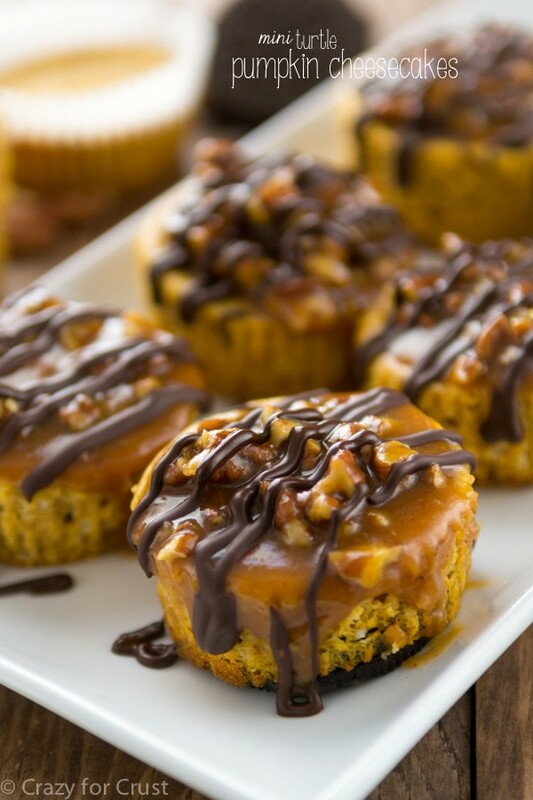 I love healthy food like mini turtle pumpkin cheesecakes. It would be perfect breakfast! I prefer pumpkin – it may reduce cancer risk, protect the skin, boost your mood and other! Thx for sharing! These mini turtle pumpkin cheesecakes are very decadent, and the people in my office are happy today!